In recent years, haunted Florida has drawn the interests of many paranormal investigators. While it is true that the state is known as “The Sunshine State”, it is apparent that the bright light that fills the tropical skies of the state casts heavy shadows and in those shadows, there are many unique mysteries that involve souls that have passed from the physical world to the spiritual worlds. While there are haunted houses, haunted highways, and haunted lighthouses in and around the State of Florida, many are starting to gain an interest in haunted schools. Flagler College St. Augustine is considered to be a school filled with shadows and spirits. If you have an interest in school spirits or haunted Florida in general, it is likely that you will enjoy this guide on Flagler College St. Augustine. In the late 1800s, a man by the name of Henry Morrison Flagler was deemed by most as one of the wealthiest individuals throughout the world. This was not at all a surprising label considering the fact that he was an entrepreneur from the State of New York and was the cofounder of the company recognized during the times as “Standard Oil”. This individual experienced many degrees of success throughout his lifetime and was highly accustomed to the power that he had because of the successes that he was able to experience. While he traveled and enjoyed many locations in the world, the one that he developed a profound interest in was St. Augustine in the State of Florida. This Atlantic coastal city was known as “The Nation’s Oldest City”, he saw the potential the city had for attracting tourists. He did not realize that he would become known as part of the history of haunted Florida as a result of his work in this city. When visiting the city, he determined that it would make a wonderful location for individuals to visit during the winter months. The sun was always bright in the sky, there were no issues associated with standard winter weather like snow, and despite a hand full of cold days, the weather was relatively nice and highly attractive to those that had to endure harsh winters in other states. As a result of this idea, Henry Flagler hired on assistants in the year of 1887 and they immediately went to work on plans to develop an exquisite hotel for those that elected to visit the City of St. Augustine. This hotel would be called the “Hotel Ponce de Leon”. Finally, after quite a bit of planning and construction work, the hotel was opened for business. This point was one of the most important when it comes to the haunted Florida stories. Unfortunately, in the year of 1895, a serious case of yellow fever developed and began to spread around the region. On top of this complication, Florida experienced one of the worst winters ever. The freeze was so intense that many individuals simply could not travel to St. Augustine to visit, or simply lacked the interest to do so because of the harsh weather conditions. Then, in later years, The Great Depression occurred. Despite the economic challenges of that time period, the hotel was able to remain open. It did experience quite a bit of success, but not for very long. By the time the 1940s arrived, tourists were not traveling to the city very often. By the end of the 1960s, the beautifully designed hotel was forced to close due to the financial strain that it was under. Despite the failure associated with the hotel, no one at the time knew it would eventually become known as one of the most haunted Florida locations on the Atlantic, or that it would be considered one of the most haunted schools worldwide. There are many school spirits that are said to haunt this college. Today, Flagler College St. Augustine is in full operation as a college. •	Many believe that Henry Flagler had romantic relations with not only the women that he took as wives, but also with other women before, during, and after his marriages. It is said that he developed a relationship with one woman that really wanted him to commit. However, Flagler did not want to take this route. He was not ready to commit to her. Due to the anger and heartbreak that she suffered from, it is said that she went to the fourth floor of the structure and hung herself from a beautiful chandelier there. From the 1960s, many students and educational staff members claim that the spirit of this woman may be seen hanging from the chandelier. The room that she did this in is now referred to as the “Mirrored Suite”. When it comes to haunted Florida stories, this one seems to hold a lot of truth according to those that have experienced this apparition. •	Before Henry Flagler passed away, it is said that he instructed those in charge of his final arrangements to ensure that during the funeral, they opened all of the windows as well as all of the doors. He felt that this would permit him to pass from the physical world into the spiritual world. However, the individual known to perform maintenance work around the building closed up all of the doors and windows without knowing Flagler’s request. The way that it is told, the spirit of Flagler did attempt to leave, but was instead hit with a great deal of force, which pushed him back and pushed his spirit into one of the tiles in the room. 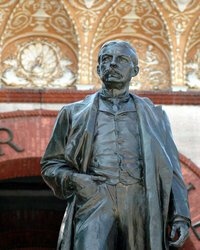 Many individuals to this day state that they see the face of Henry Flagler peering back at them. This is one of the most popular haunted Florida accounts given by students and educators at the haunted college. •	Many individuals claim that they have seen the spirit of Henry Flagler in various locations of the haunted St. Augustine school. Given the amount of time and effort that he put into creating the structure, it only makes sense that one of the school spirits in the school includes that of Mr. Flagler himself. •	Many claim that Flagler’s second wife haunts Flagler College St. Augustine. Her name was Ida Alice Flagler in life. At first, she seemed well put together and under control. However, as time progressed, she seemed to suffer from some type of mental affliction. It is common for witnesses to claim that they have seen her spirit lingering in the gardens of the haunted college, and quietly appreciating the beautifully painted ceilings within the structure. 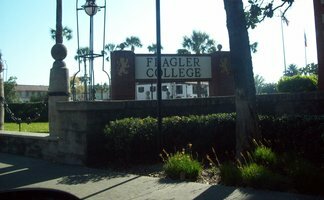 •	When researching haunted Florida, you may hear about the popular “Lady in Blue” that is said to be at Flagler College St. Augustine. Many consider this apparition to be the most commonly experienced and popular among all of the school spirits that are said to be a part of this college. The story is that she became pregnant with a man she was having a romantic affair with. However, the man would not file for divorce and commit to marrying her. As a result of her sadness, she packed her items so that she could leave. Unfortunately, she tripped over the blue dress that she was wearing and ended up falling down the stairs to her death. Many claim that they have seen this mournful spirit throughout various locations at Flagler College St. Augustine. While putting time and research into haunted Florida, it is evident that Flagler College St. Augustine seems to be a vortex for all types of ghosts, apparitions, and mournful spirits. The hauntings outlined in this guide are simply stories associated with the most popular and commonly reported claims by students, teachers, and guests alike. There are many other stories that surround this haunted college, and the locals are sure to share them with you. If you are into learning about haunted Florida, haunted schools, or just Flagler College St. Augustine in general, you are sure to find many other ghostly tales and stories of unexplained phenomenon that will intrigue you.